Despite recently getting a cold shoulder from some researchers, a long-standing idea that North America's first settlers entered the continent via an ice-free inland corridor boasts more scientific support than any other proposal, an international team says. New World colonizers from Asia may also have traveled by canoe down the Northwest Pacific Coast and perhaps much farther, as critics of the ice-free corridor hypothesis have argued. But less evidence supports that possibility, archaeologist Ben Potter of the University of Alaska Fairbanks and colleagues argue in a research review published online August 8 in Science Advances. Whatever route they took, people didn't reach North America until after 16,000 years ago as temperatures rose near the end of the Ice Age and shoreline food sources expanded, the interdisciplinary group concludes. Widespread human occupations appeared in the Americas by about 13,500 years ago. Sites from this time were inhabited by the Clovis people, best known for long, triangular spearpoints used in hunting big game. Advocates of a primarily coastal migration, however, have suggested that shoreline-hugging seafarers entered the Americas much earlier, with some archaeological evidence putting people in South America by nearly 20,000 years ago (SN: 12/26/15, p. 10). These researchers point to a study of plant and animal DNA from ancient lake beds that indicates an interior passageway through the North American Arctic could not have provided enough food until about 12,600 years ago (SN Online: 8/10/16). Potter's group refers to opposing evidence suggesting that the presence of edible plants and prey, such as bison, could have sustained human treks through an Arctic opening even earlier than the oldest known Clovis groups. Combined with an analysis of DNA from an 11,500-year-old Alaskan child, archaeological finds best support a situation in which ancestral Native Americans inhabited northeastern Asia until roughly 16,000 years ago. 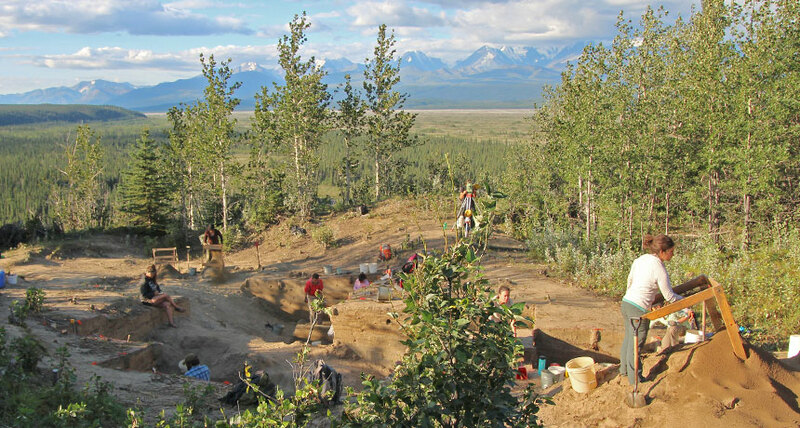 Abundant evidence of human occupations before then appears in southern Siberia and nearby regions, but not in North America, the researchers hold. After 16,000 years ago, an easing of frigid, arid conditions enabled people to cross a now-submerged land bridge to North America. Migrations through an ice-free corridor gain further support from the fact that the oldest securely dated human sites have been found in North America's interior (SN: 6/11/16, p. 8), Potter says. Travelers who reached South American sites near the Pacific 14,000 years ago or earlier made stone tools that show few similarities to those of later Native American groups, the researchers say. Those folks may have hugged the coast on the way to South America, but their distinctive tools indicate that they didn't contribute much to later Native American cultures, the team contends. "We can't exclude either coastal or inland routes for the first Americans," Potter said at a news conference on August 6. Still, "a preponderance of evidence" favors migrations through an ice-free corridor, his team concludes. Available evidence doesn't tilt one way or the other, says anthropologist Tom Dillehay, who has led archaeological excavations in Chile and Peru. Too few ancient human sites have been excavated, and too little ancient genetic and ecological evidence is available, to dub any one model as the best supported, says Dillehay, of Vanderbilt University in Nashville. Early South Americans display clear cultural links to later South American groups, he argues. Human colonization of North and South America proceeded in different, poorly understood ways, he suspects. Archaeologist Jon Erlandson of the University of Oregon in Eugene, who is a leading proponent of coastal entries to the Americas, acknowledges that an ice-free corridor remains a possible option. But there's a big hole in the argument for inland migrations: Decades of exploration along more than 1,600 kilometers of what was once a proposed ice-free corridor have uncovered no Clovis or pre-Clovis sites. "The search for similar sites along the Pacific Northwest Coast and points south is in its infancy," Erlandson says. Rising seas covered less than half of this coast at the time of initial crossings into North America, so prospects exist for discovering additional remains of ancient coastal travelers.